Fictionalized account of the lives of Otto and Elise Hampel who decided in the wake of losing their son on a battlefield in France and the endless persecution of a Jewish neighbor that Hitler had to go. They quietly revolt by leaving anti Nazi postcards around Berlin. The cards are turned in and police begin to search for the people behind it. Beautifully acted film about the quiet desperation some feel in the face of tyranny. This is exactly the sort of film that you'll want to sit down and watch on a rainy afternoon and go somewhere else for a while. 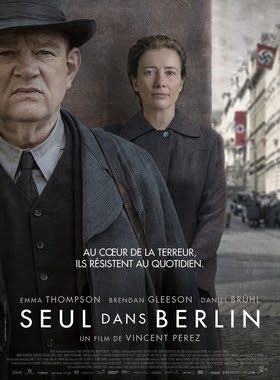 Brendan Gleeson and Emma Thompson are wonderful as the subversives giving some of their best and most restrained performances. You truly feel for them. What would be a solid little historical film takes on all sorts of new resonances thanks to the current political situation in America. Say what you will the films message that we all must stand up and fight, if even in a small way is one that will not sit well with the current administration in Washington. There is something about the march of life that often changes how we look at art. I say this because if I had seen this film early in 2016 when it played in Europe I would have reacted differently. It is thanks to the current political situation that the film moves for a a film that is very good should see to an excellent must see.